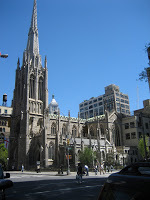 Abutting the north side of James Renwick Jr.’s lacy Gothic Grace Church at Broadway and Tenth Street sits the Rectory. Set back from Broadway by a manicured greensward, the matching stone offices are entered via a curving flagstone path. You might as well be in mid-19th century Britain at one of the innumerable such churchyards in any Anglican diocese. Whether because Broadway takes a sharp turn southward from its southeasterly path down from Union Square, or for reasons unknown, traffic noise in this section of the boulevard diminishes a great deal. The yelps of Grace Church schoolchildren frequently drown out all but the most insistent klaxons from delivery trucks passing by. In this very structure, behind these very gates, Reverend Thomas House Taylor, D.D. intoned Harvey Burdell’s funeral service in February 4th, 1857. Lengthy delays obtained that day as guards attempted to quell the uproar in Broadway. Despite the inclement weather, thousands of curiosity-seekers gathered to witness the ceremony, the majority of them women. Crowds pressed against the iron gates, which were bolted shut until the last moment. I went to Grace Church one afternoon several years ago to try and ascertain why Harvey Burdell was buried from the Church. Perhaps he or a family member were parishioners, though that seemed unlikely to me. Pews in the ultra-fashionable sanctuary were auctioned off to the highest bidders when the congregation moved to its new structure. completed in 1846, and the house filled with wealthy New Yorkers eager to see and be seen as spiritually upper-crust. I speculated that Harvey Burdell’s taste for the high life did not extend to matters of the hereafter. The parish archives have no record of his family name. Research, though my favorite part of writing Butchery on Bond Street, was often a dull and tedious task. Hope springs eternal, but many days belied this adage. Eight hours or more of leafing through dusty documents and obscure volumes frequently resulted in nothing more than a headache and an allergy attack. More than once, though, it was at the end of a long day of failure that my losing streak would break. Such was the case at Grace Church. Take a walk down Broadway on a weekday, enter the Rectory greensward by the little iron gate. Ask permission, as I did, to enter the ground floor meeting room where sofas and lamps are interspersed by grand oil paintings, hung professionally in the cottage style space. On the west wall of this grand room I bent to inspect the name of the cleric whose portrait shines more brightly than most. A tedious day of eye-strain and dashed hopes was suddenly all worth it: “Thomas House Taylor, D.D., Rector 1834-1867” read the little gilded plaque. How could I get so lucky? Of all the parish notables from the past 175 years, Taylor is one of a very few that hang on public display. 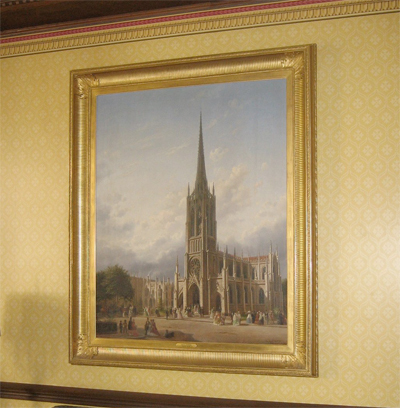 And directly opposite, across the room, hangs an oil depicting the Church. I approached to get a closer view. Horse drawn carriages and churchgoers in their mid-19th century Sunday best dot muddy Broadway. The same gates that sit there today adorn the western façade. Though the painting was executed in 1895, again I’d struck pay dirt. 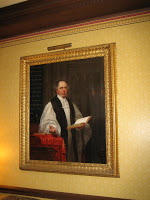 The artist’s representation, per the plaque, is of the church as it appeared in 1858, the year after Burdell’s demise. So read the account of Harvey Burdell’s funeral in Chapter 6 of Butchery on Bond Street, go visit Harvey’s Green-Wood grave, perhaps download and print the images below. I got lucky: they’re the real thing. Hope you enjoy them as much as I do.